BANGI, 21 Nov 2013 – An economic system based on Islamic principles is the best alternative to the present structure which reflects Western capitalism which encourages social imbalances. Adjunct Professor of Economics and Development Studies at Universiti Malaya, Tan Sri Dr Kamal Salih said the current pursuit of a free market is flawed and only creates social and economic inequalities. Speaking at the Ninth Ishak Shari Memorial Lecture here today on In Search of a New Economic Paradign using the Malaysian Case, Dr Kamal said an Islamic view of economics is more equitable and just for everyone. The memorial lecture was organised by the Institute of Malaysian and International Studies (IKMAS) at The National University of Malaysia (UKM). Dr Kamal gave the example of consumption tax, which was first prescribed in Islam. Now it is known as the Goods and Services Tax (GST) or Value Added Tax (VAT). The principle is to charge on the consumption of goods and services at every stage of the supply chain, with the tax burden ultimately borne by the end consumer, unlike the existing sales and service tax (SST). Another economic concept originated from Islam is the limited liability partnership (LLP), in which some or all partners have limited liabilities. It therefore exhibits elements of fair partnerships and corporations. In an LLP, one partner is not responsible or liable for another partner’s misconduct or negligence. This is different from the traditional unlimited partnership where each partner has joint and several liability. In an LLP, some partners have a form of limited liability similar to that of the shareholders of a corporation. He said the present capitalist system has made Malaysia too dependent on foreign investment, which could hurt the economy if there is a downturn in those investor nations. The Western capitalism system, he said, had not brought social justice to society. There is no real “middle” class, as half of the population is at the bottom of the income ladder with only 21.5% of the income against the top 10% of the population who have up to 32% of the total share. The remaining 40% of the population owns 46.5% of the wealth. It would appear that half of the population – regardless of race – make less than even the middle class. This gap has remained steady for the past three decades and there is little chance of there being a more balanced income distribution, Dr Kamal said. The capitalist economies are also defined by ownership, power and livelihood disparities between capitalists and workers. The Capitalist system is inherently unequal and exclusionary and lack impetus to foster more inclusiveness. He said many scholars are now reviewing the Islamic worldview to make it more relevant to the current situation. Proof of the relevance is the success of Islamic finance and banking in leading the way, in which even the West is beginning to adopt. Already some scholars are anticipating some convergence with conventional banking – without the usury. Present at the lecture was IKMAS director Prof Dr Rashila Ramli. Director of the Institute of Ethnic Studies (KITA) Distinguished Prof Shamsul Amri Baharuddin made the introductions to the lecture. 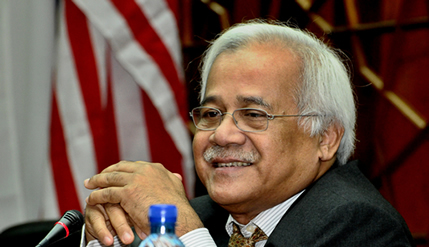 The Ishak Shari memorial lecture series was named after Prof Ishak Shari (1948–2001), a noted scholar and researcher originally trained as an economist. Prof Ishak always looked beyond his discipline and embraced the social sciences as a whole particularly social justice. Starting as a lecturer in 1972, he rose within the ranks to become Professor of Development Economics in 1991, Dean of the Faculty of Economics (1988-1990) and Dean of the Centre for Graduate Studies (1994-1997). In 1997, he was appointed Director of IKMAS, a social science research institute at UKM, a post he held until his death. Prof Ishak’s leadership helped turn IKMAS into a respected regional centre for globalisation and transformation studies.